Buying jewelry is all about trust and you can trust Laneys - we have been serving the Williamsburg community for almost thirty years. We live here in this community and support local charities and clubs and businesses. We are here for you above and beyond what a big corporation would be because we know that word of mouth is the lifeblood of local business. We appreciate you as well as your business. Thank you! As we get older, sometimes we get larger, too. At Laneys we will make sure your jewelry grows with you by resizing your rings, adding links to bracelets, necklaces, etc. We would also be happy to help you choose and purchase upgrades. Your relationship with your jeweler will last a lifetime. In fact, for many families, it stretches from one generation to the next. In a world where mass production and volume retail is becoming more common, some people settle for cookie cutter jewelry. When you buy from Laneys, your local jeweler, you can choose from styles that have been selected just for your individual taste. At Laneys, you receive individual service that you can never get from a mass merchant. You are important to us at Laneys! You are a friend and neighbor and not just a face in a crowd. We will remember your special occasions. We will remember what your spouse tried on during a recent visit. As your jeweler, we can suggest some earrings to match a necklace you bought last year. With special jewelry gifts that represent significant events in your life, you want to make the moment match the emotion - at Laneys we can help you personalize your purchase. Not only does your jeweler care about you, we care about your jewelry too. Cleaning your jewelry keeps it beautiful. At Laneys we will clean and check you jewelry as a free service to our customers. Regular checking can keep your jewelry in tip top shape or catch a bent or broken prong before the diamond is lost. When you buy from a mass merchant, the person behind the counter might have sold electronics or ice cream the week before. When you buy from Laneys, you will get good advice from professionals - we have gemological training, read professional journals and trade magazines to keep up to date, travel to seminars and trade fairs. We can help you be an educated buyer and choose jewelry that is right for your life style. EIGHT: We do it all! At Laneys, we are a full service jeweler. We can put a new battery in your watch (we even have a watch maker if it needs service beyond that), restring your heirloom pearls or costume beads, perform professional jewelry appraisals complete with digital pictures, repair your broken treasures with state of the art technology. We can even duplicate worn out treasures or custom design new ones. 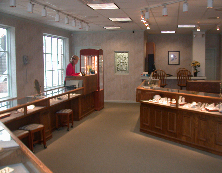 At Laneys we personally select each piece of jewelry and each gemstone in our cases. We dont sell merchandise from some central warehouse. We sell only what we carefully select for quality, workmanship, individuality and beauty. Since we care enough to carefully look at every jewelry item before buying it, shouldnt you? If you buy from a web site or a big box merchant, you may not receive what you were expecting. Come into Laneys where you can compare different pieces side by side and try it on before you buy. If you dont see what you want, a real jeweler can find it or make it for you. If its something simple, we can special order for you from one of our trusted suppliers. We can usually even replace a single earring that has lost its mate. We specialize in custom designs where you have input every step of the way from the design to the wax prototype to the casting to the finished treasure. This can be done completely from scratch or we can remake an old piece that you dont wear into your jewelry dream design come true.